The World Police and Fire Games are an international, biennial athletic event, open to active and retired police officers, firefighters, customs and corrections officers from all over the world. It is the world’s second largest multi-sport event, typically attracting in excess of 10,000 participants. Only the Summer Olympics attracts a larger field of competitors. 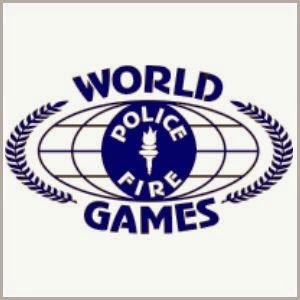 The concept for the World Police and Fire Games evolved from the California Police Olympics, which were first held in 1967. The Police Olympics were founded by San Diego Police Lieutenant Veon “Duke” Nyhus who recognized the need to promote physical fitness and camaraderie among members of the law enforcement community. The Police Olympics were such a success that they became on annual event. In 1983, work began to create a similar event, but on a global scale. The inaugural World Police and Fire Games were held in San Jose, California, in 1985. One of the more than 65 sports contested at the Games is armwrestling. In fact, armwrestling has been part of the Games since the very beginning. The sport was first included in the California Police Olympics way back in 1972. Though unconfirmed, the sport’s addition was likely inspired by the growing attention armwrestling had been receiving since the Petaluma World Wristwrestling Championship first began airing on national television in the early ‘70s. Originally, the sport was referred to as “arm wrestling”, however this was changed to “wrist wrestling” in 1993. It continues to be called “wrist wrestling” to this day. However, it is believed that armwrestling rules have always been used. From 1985 through to 2009, only the right arm was contested. This finally changed in 2011, when an open left handed division was added. The number of weight classes has increased slightly in recent years, and there are four age-based divisions: Open (open to all, but designed for competitors 18 to 29 years of age), Senior (for competitors 30 years of age or older), Master (for competitors 40 years of age or older), and Grand Master (for competitors 50 years of age or older). Competitors may only compete in one division. The majority of competitors who take part are not competitive armwrestlers. Nevertheless, there are some exceptions. The most successful competitor in World Police Fire and Games armwrestling history is Robert Viens, a firefighter from Montreal, Quebec, Canada. He has won six gold medals at the games between 1991 and 2011. Robert was a competitive armwrestler in the late ‘80s and early ‘90s, with Canadian National and North American titles to his credit. A handful of other competitive armrwrestlers have also won gold medals at the Games, including American Mike Ayello, Canadians Ryan Espey, Kayne Hemsing, and Bernie Walker, and Russian Vladimir Stepanov. The following is the complete list of competitors who have won gold medals in armwrestling at the World Police and Fire Games, from 1985 to present. Men’s Right - 200 lbs and under Senior (30-39 yrs) - T. Glazier Jr.
Men’s Right - 250 lbs and under Senior (30-39 yrs) - W. deMathews Jr.
Men’s Right - Unlimited Open (18-29 yrs) - W. deMathews Jr.